Thanks, Dennis. Everything has been fine with the fridge since the repairs, so we're hoping those issues are behind us now. It's beautiful...chop it up in a dish or fry it up as a tapas or grill it with shrimp....endless possiblities. Recipe? These look *amazing*. You guys have helped me gradually get over my fear of making sausages. This is definitely something worth learning as once you get the basics down, there's no limit as to what flavor combinations you can dream up. Thanks. :) I want a meat fridge now. Don't think I can wait for Santa to give me one. 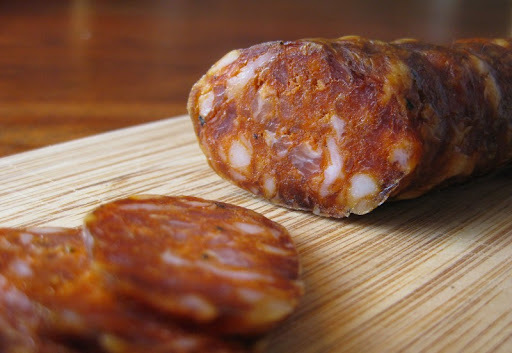 Peter - we're thinking about doing a post comparing this sausage fresh, smoked and cured. If we do, we'll pull the recipe together. SheSimmers - yep, being able to make whatever kind of sausage you like is definitely cool. Hi Shayne - no bravery required, just a controlled curing chamber. If you have that, the rest is pretty easy. I am curious to know what kind of cure you used for these sausages. I am trying to see if only using salt (with no nitrates added) would suffice. Hi Gabi, We used kosher salt and curing salt #2 (sodium nitrate). 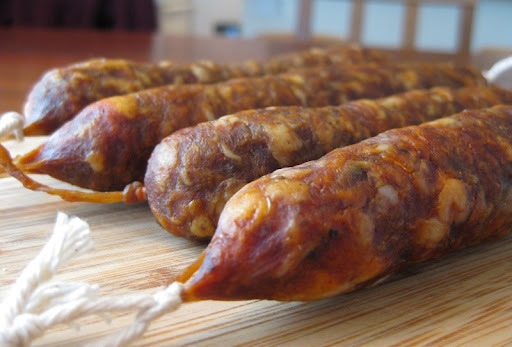 Sausages can be cured without adding nitrates/nitrites, but it's a lot riskier - I wouldn't do it myself. 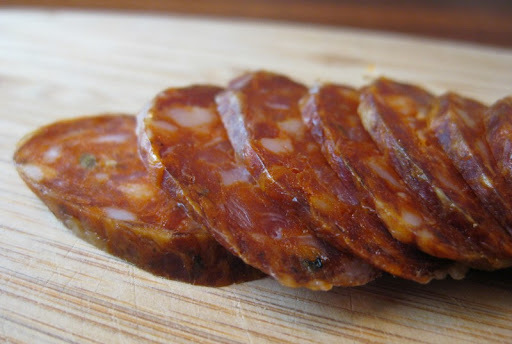 The nitrites promote a rosy pink color and add a distinctive cured flavor to the meat, but more importantly, they kill harmful bacteria, especially botulism.